January, 24th 2012, Rybinsk. – The idea of establishing a competitive purchasing system driven by the need to optimize the company’s purchasing operations using the means of the b2b-saturn electronic-commerce domain integrated into the global b2b-Сenter electronic trading system came to NPO Saturn OJSC in October 2010. In 2011 NPO Saturn implemented the first steps of carrying out its purchasing activities on a competitive basis. From May to December 2011 using the b2b-saturn e-commerce domain, the company had put up for a trial run 194 items which constituted no more than 10% of the company’s overall purchasing needs. The cumulative saving on these items amounted to 8.5 percent which is considered a good economic indicator. Paris, January 23, 2012 – On January 17, 2012, PowerJet received the type certificate for its SaM146 1S18 regional jet engine from the European Aviation Safety Agency (EASA). January, 19th 2012, Rybinsk. – Today at the City Hall of Yaroslavl Region, a working meeting between the region’s governor Sergey Vakhrukov and NPO Saturn chief executive officer Ilya Fedorov took place. January, 19th 2012, Rybinsk. – On January, 18th 2012 the management of the united industrial company Oboronprom OJSC and MC United engine corporation OJSC headed by the general director, a member of general committee of Russia’s union of machine builders Andrey Reus visited NPO Saturn. 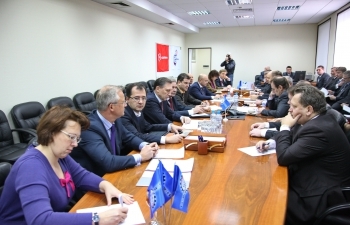 The delegates of Oboronprom attended a meeting with the top-management of NPO Saturn during which the company’s performance in 2011 and its development plans for 2012 were reviewed. A dedicated discussion took place on the implementation of the Federal Target Program “Development of the defense-industrial complex” including the execution of work on the marine engine program; the current status of the SaM146 program; execution of work regarding the PD-14 engine and a number of other items.